weBike uses SMS texting to identify bikes and provide users with lock combinations, minimizing bike share costs and the need for "stations." Photo via weBike. A small start-up near Washington, D.C. has started what it calls “the first stationless smart bike sharing program in North America.” And all it took to get the system up and running was some bikes, U-locks and mobile phones. In the fall of 2007, Allie Armitage and three classmates at the University of Maryland, College Park, just outside of the nation’s capital, decided to design a campus bikeshare program for their “Systems Thinking” course. Armitage says one team member, Vlad Tchompalov, had just seen the new bikeshare systems in Paris and Berlin and thought they could implement a smaller-scale version on their 37,000-student campus. They figured that a system with stations would be a huge step up from the communal “yellow bike” programs in places like Portland, Ore. that failed because the bikes were left unlocked and most were stolen. But when they approached the university about installing the bikesharing stations, they hit a wall – of bureaucracy. They went to their faculty advisor, Dr. Gerald Suarez, for advice. “And he said, ‘Well, what if you don’t have stations at all,’”Armitage says. Following the advice from their professor, Armitage, Tchompalov and their classmates Yasha Portnoy and Brad Eisenberg developed software that lets users check out and return communal bikes with text messages – without having to use any sort of station. Operating under the name weBike, the team refurbished 12 bikes with the help of a local youth program. 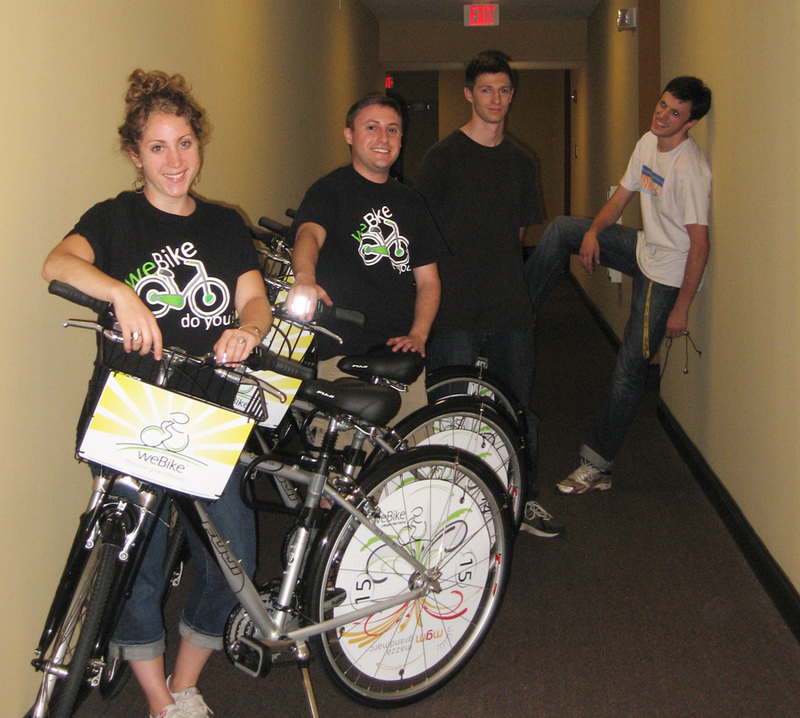 With these bikes they began a pilot program at the University of Maryland campus in September 2009. 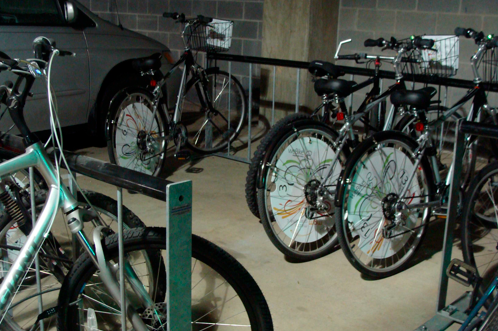 The group locked the 12 bikes to various bike racks and posts around campus with standard combination-protected U-locks and then listed the bike locations on the weBike website. To check-out a bike, students texted the bike’s ID number to weBike and weBike generated an automatic text back with the combination to unlock the bike. The students could have the bike for up to 30 minutes before having to lock the bike back to a rack or post at a location on campus and text the bike’s location and ID number to weBike. If the bike wasn’t returned within 30 minutes, weBike’s system would text the user once an hour until the bike was returned. The weBike team would check in on the bikes and make needed repairs (though customers could text “damage” if a bike needed to be fixed) and periodically change the combinations on the locks. During the three months that the pilot program ran, more than 50 users logged a total of about 550 rides, or about 6 rides system-wide per day. Only one bike was stolen. Perhaps the best part: weBike only spent $2,000 to develop and run the program. Despite the relative success of its pilot program, the University of Maryland never put out a bid for a full-scale program. But a student who used the weBike pilot program told Armitage that her apartment building, which is two miles off campus but lies on a bike path, might benefit from a bikeshare. Armitage contacted the Mazza Grandmarc apartments and a few months later, in September 2010, the apartments had 15 new Fuji Crosstown bikes locked to a rack in front of its buildings. weBike employees Allie Armitage and Brad Eisenberg prepare to go for a ride with Mazza Grandmarc residents. Photo via weBike. Armitage says most of the Mazza Grandmarc’s approximately 600 residents are students and use the bikes to ride to campus or the grocery store. The Mazza Grandmarc owns the 15 bikes and pays weBike a monthly fee to run the texting system that allows users to check out and return bikes. Users have 24 hours to ride the bikes wherever they’d like before they return the bikes to the rack at the Mazza Grandmarc. An apartment employee changes the bike locks’ combinations twice a week and does routine maintenance, like pumping up the tires. A professional mechanic comes to the apartment once a month to do things like align the wheels and make sure the brakes and gears are working properly. During its first three months of operation, the weBike station at the Mazza Grandmarc had more than 85 users take about 300 rides on the bikes. Two of the bikes went missing for short periods of time but were recovered. None of the bikes have been significantly damaged. According to Armitage, weBike is planning to run a small 7-bike system on a boarding school campus in New Hampshire and has been talking with the University of North Carolina, Chapel Hill about starting a system there, as well. And unlike many municipal systems, like those in London and Montreal, weBike does not use special bikes that have limited parts to deter theft and reduce damage. Changing the U-lock combinations is also cumbersome, and users could potentially keep unchanged combinations and use the bikes later without checking them out. WeBike is working on developing its own lock that will automatically generate a new combination after each use, Armitage says. Still, the weBike model has real advantages, especially for small communities and community developers “who want to give another service to their residents,” Armitage notes. The need for little infrastructure is especially appealing: Armitage estimates that weBike’s up-front costs are only 15 percent of that of a station-based system. An added bonus: without stations, the bikes can be ridden door-to-door. This is not to say that weBike doesn’t have competition. The New York City-based Social Bicycle System, also known as SoBi, which we recently mentioned in our Tech Innovations for Transit post, is developing its own prototype of a station-less bikesharing system. SoBi Bikes in New York City. Photo by The Social Bicycle System. The basic concept is the same: bikes are locked to normal bike racks or posts and riders use their mobile phone to reserve a bike. 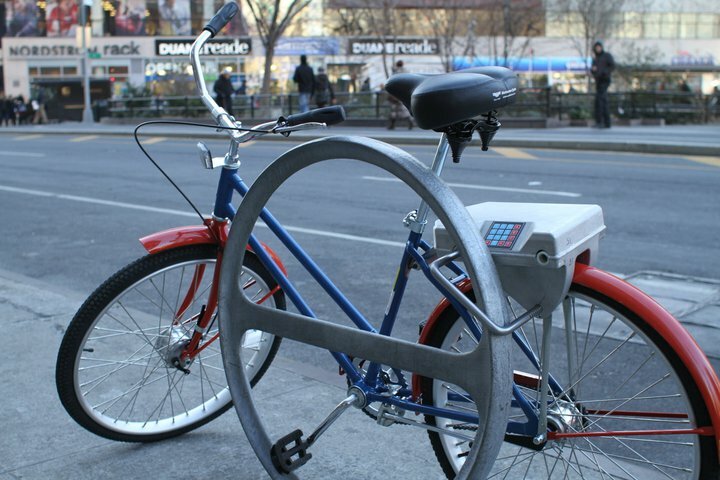 The difference is that SoBi has its own lock and sends users a unique PIN number to unlock the bike. The bikes also have GPS to track their locations. SoBi says it will do a public testing of its system this spring in New York City. Its first full pilot program will be implemented at Indiana University next fall. Another competitor is viaCycle, based out of Georgia Tech in Atlanta, Ga. Like SoBi, it has developed its own lock and uses GPS to keep track of its bikes. On-board technology is “constantly monitoring for maintenance needs or unauthorized use,” according to the company’s website. ViaCycle says that in about a month it will finish its latest prototype and launch a 40-bike pilot at nearby Emory University. Armitage is aware of these competitors but thinks weBike is a step ahead because “getting on the ground is really critical.” weBike already tested and implemented its system and has a paying client. It has dealt with technical malfunctions (the first day the system was running at the Mazza Grandmarc, a person actually had to sit there and text users,) university bureaucracy, missing bikes and client payment plans. In the real world, having a person to deal with problems like these is just as important as the technology. Tags: bike-sharing, cycling, innovation, SMS, technology, United States, University of Maryland, walking, Washington, D.C.